Amid increasing unease over U.S. trade and immigration policies, Canadian Prime Minister Justin Trudeau visited Silicon Valley companies last week and asked them to invest in Canada. It was the first visit of a Canadian Prime Minister in San Francisco since 1945. His trip wrapped up with a closed-door meeting with Amazon CEO Jeff Bezos. Here is a quick recap of what happened during his visit. Trudeau began his trip by picking up a big investment from Salesforce Feb. 8. Marc Benioff, Salesforce CEO, announced the online business software company will invest another $2 billion in its Canadian operations. During the announcement, Benioff said “We connect with you on your values,” referring to Canada’s diversity and immigration policies. Shortly after, Trudeau met with Dan Saks, President and Co-CEO, AppDirect, who announced the company will add at least 300 jobs in Canada within the next five years. AppDirect is already tapping into the country’s tech talent by supporting nearly 300 jobs in Canada with a focus on engineering and product support. 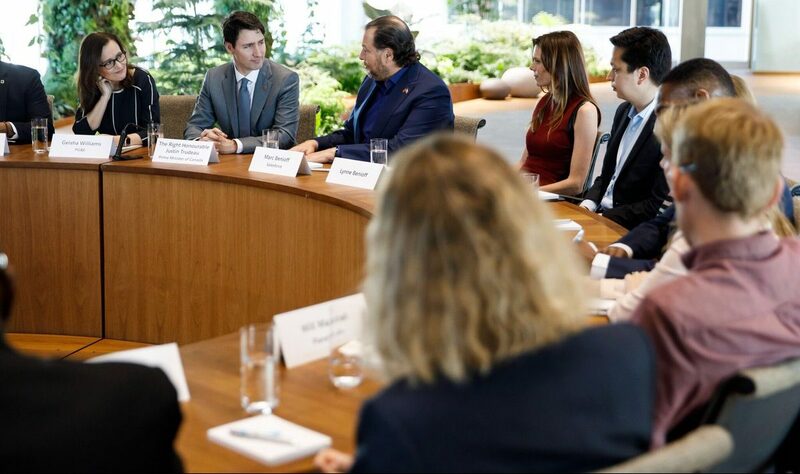 “Prime Minister Trudeau’s landmark visit showcases the importance of strengthening the connection between Canada and Silicon Valley,” said Saks. Trudeau and Saks first met in a political science class at McGill University in Montreal. Later that day, Trudeau had a closed-door meeting with Amazon CEO Jeff Bezos. On Twitter, Trudeau said the two talked about investing in Canada and creating more high-quality jobs. There’s a good chance that Trudeau used the opportunity to further pitch Toronto as Amazon’s next location for HQ2. Toronto is the only Canadian city on Amazon’s shortlist for the new headquarters. Trudeau also met with the CEO of eBay Devin Wenig, and Robert A. Bradway, CEO of Amgen. On Twitter, Trudeau said they talked about Canadian tech talent and big data.